Larry Kudlow endorses Palin for VP!!!!!! UPDATE: Here's a link to the video of the interview (12 minutes long). looks like I'll have to wait for a transcript on the actual endorsement. UPDATE: I'm glad I watched the whole show. Kudlow just came back on at the very end of the show and officially endorsed Palin for VP! WOW!!!!!!! I just watched Gov. Palin on "Kudlow and Company", and she did a great job on drilling, AGIA, Stevens, and even "Troopergate". I'll get you the video as soon as I can. Larry Kudlow has posted at National Review Online that he will be having Gov. Palin on "Kudlow and Company" tonight (7 PM Eatern) to dicuss ANWR, AGIA, the Stevens indictment, and of course the veepstakes. He describes her as a "leading candidate to be McCain' veep", so it should be interesting. Hopefully, we will also get some great soundbites to counter the Troopergate non-scandal (which was in the Wall Street Journal this morning). Kudlow is a good interviewer, and I can see him saying something like "so let me get this straight, your state trooper ex-brother-in-law said he wants to kill your dad and they're investigating you for talking to the police about it?!" Tonight on CNBC I’ll be talking with Alaska Governor Sarah Palin. Obviously, Palin’s a leading candidate to be McCain’s veep. InTrade prediction markets have her at 20 percent, third behind Romney and Pawlenty. I’ll be talking to her about drill, drill, drill. Has she made any progress persuading McCain to drill in ANWR? And what’s the latest in her battle for a new Alaska pipeline? We’ll also talk about the Sen. Ted Stevens indictment, as well as Don Young (the other Alaska pork-barreler). I’m also going to ask her what it means to be a conservative these days. National Review editor says a Palin nomination could "save lives"
Kathryn Jean Lopez, the editor of National Review Online (NRO), posted a column today saying that "John McCain could save lives with his vice-presidential pick." Of course, the pick she had in mind was Sarah Palin. I'd tell you what she means by the "save lives"...but then I would be spoiling the article for you. So, be sure head over NRO and check it out. I will be posting about some of the other recent news later today, but I thought that this column deserved special attention. Another great web-ad courtesy of Students of America. I think it's great to have so many ads coming out on YouTube. Very few potential VPs can inspire people the way that Sarah Palin has. Palin on FoxNews' shortlist while her "perfect opponent" leads Obama's VP race! UPDATE: Oops, here's the link to the correct video. This video is very interesting. Sarah Palin is only briefly mentioned, but she is put on the list. Meanwhile, today's buzz indicates that Virginia Gov. Tim Kaine has the inside track for the Democratic VP nod. Now, consider that pollster Scott Rasmussen suggested a few weeks ago that, should Kaine be Obama's running mate, Palin is the best candidate to put up against him (if you listen Rassmussen's appearance with Sean Hannity, he specifically says that Palin is the best choice on the condition that Obama chooses Kaine). Tim Kaine is the prefect foil for Palin. He is a first term governor who makes little national news, so an Obama-Kaine ticket is double trouble when it comes to inexperience and lack of notable achievements. Kaine was also one of Obama's earliest endorsements in the primary race, so he does absolutely nothing to reassure Hillary Clinton's voters. With her record of producing real change backed up by John McCain's years of experience, Sarah Palin can slice, dice, and julienne Tim Kaine in the VP race. He's the perfect opponent. Apparently also in contention for the Democratic nod are Senators Evan Bayh (IN) and Joe Biden (DE). Again, great foils for Palin. Biden is has been a part of the Washington establishment since 1973 and has a severe case of Foot-In-Mouth Disease combined with a chronic case of Can't-Shut-Up Syndrome. Palin would make short work of him. Bayh might be a slightly better choice, as he was a big figure in the Hillary campaign, but he is still a longtime part of the Washington machine and totally undermines Obama's "change" message. So, if McCain is gutsy enough to take Palin, it's starting to look like Obama will play right into his hands by naming Kaine, Biden, or Bayh to the ticket. 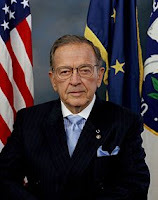 And yes...I heard that Ted Stevens got indicted. I'll talk about that later. A poll conducted last week by the Hays Research Group shows that Gov. Palin's approval rating is still an astronomical 80%! So much for the thoroughly debunked "Troopergate scandal". That horse is dead, so we're going to stop beating it. If you haven't looked at our petition lately, we have almost 2000 signatures (currently sitting at 1971). Hence, I have decided that I will be sending printed copies of the petition to John McCain Headquarters, Gov. Palin's office, and the Alaskan media once we hit 2000. So, if you haven't signed yet, click on the "Sign the Petition" link on the right side of your screen and add your name to our list of supporters. Palin leads Wall Street Journal VP poll! Well, we have now reached the end what has certainly been a long week for us and Gov. Palin. Considering the amount of unfounded mud that has been thrown at the Governor, I think that we should definitely be sending letters of support to let her know that we are praying for her. Next week should be much more fun, with the gasline due to come to a vote in the Senate. Also, I've about had it with the Alaskan media's refusal to publish key facts regarding the Halcro/Monegan/Wooten circus, so it might be time to start hodling their feet to the fire. Any suggestions? Enjoy the weekend, and I hope that you will all be pumped up and ready to go on Monday. This one comes courtesy of "Students for John McCain" (Not an official part of the McCain campaign, but a good group). I love how they used the clips from last years Kuwait trip spliced with quotes from Senator McCain. I'm proud to welcome yet another new pro-Palin site, PalinForAmerica.com, to our movement. The site is informative and beautifully put together; a wonderful addition our efforts. Also be sure to check our other sister sites, PalinForVP.com and "Sarah Palin for Vice President". Gingrich names Palin, Jindal his top two VP picks. Click here to listen to Speaker Newt Gingrich name his top two choices for McCain's VP pick. While he lists Jindal as his first choice and Palin as his second, Jindal is vehemently denying that he will be on the ticket. Hence, this becomes, for all intents and purposes, and endorsement of Palin. Pipeline passes State House as Monegan allegations implode! This is a great night for Gov. Palin, the State of Alaska, and our movement! Gov. Palin's plan to build a natural gas pipeline was approved tonight by the State's House of Representatives, sending the plan to the Senate for final approval. If passed, the licensing of the TransCanada corporation to construct this pipeline will be the crowning achievement of the Palin administration. Meanwhile, Gov. Palin has put out a press release containing information that devastates the allegations made by former Public Safety Commissioner Walt Monegan. For instance, did you know that Todd Palin was ordered to discuss Trooper Mike Wooten with Monegan by the head of the Governor's security detail? How about the fact that schedules disprove Monegan's claim that he only met with Palin four times in seventeen months? It turns out that they had over two-dozen meetings during that time, including several visits by Monegan to the Governor's home and joint trips to remote parts of Alaska. The circus looks to be drawing to a close, with Palin coming out squeaky clean! Palin siezes 2nd place in Intrade VP market! As of today, Gov. 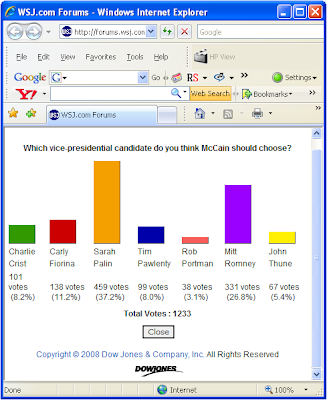 Palin has stormed into second place in Intrade.com's ranking of potential VP's for John McCain. Right now, she is trading at $19.9 and rising, higher than every candidate except Mitt Romney (and his numbers are starting to drop). Meanwhile, Jonah Goldberg has an article in today's LA Times detailing the pros and cons of each potential VP pick. Palin is ranked as a "Medium risk" pick, and Goldberg says that she "could be a home run" (the only candidate he noted as having such potential). Unlike most of the other candidates, she also does not have any major groups listed in the column marked "Alienates". The only listing is"Alaska's kleptocracy" (and they NEED to be alienated). As some commentors are fond of saying that I "need to get a job in DC", I figured that I should probably announce this. I am, in fact, moving to Washington, DC on the 19th of next month to begin an internship with Townhall.com. I am very excited to have the opportunity to learn more about the nuts and bolts of the blogging business, as I will be working in the department which is in charge of maintaining the website and controlling content on the Townhall blog. Don't worry, this will in no way affect my ability to maintain this blog. I am committed to seeing this effort through, and I'm not going anywhere. * Townhall.com is not, and will not become, affiliated with this blog or the Draft Palin Movement in any way. Here is my full video response to Andrew Halcro's salacious allegations against Gov. Palin. Part 1 is an introduction to the situation, while Part 2 details several key aspects of the case. I am on an extreme time crunch at the moment, so I will have to post all of my supporting documentation this afternoon. However, you can find all of the documents cited at KTVA.com (yellow box on the sidebar). While I am still working on getting my YouTube response to Andrew Halcro loaded (I'm now trying to use a totally different program to upload the video after the first one aborted the operation), I would be remiss not to mention another huge development today. For the first time, Gov. Palin has broken onto the Washington Post's "Friday Veepstakes Line", a weekly ranking of each candidate's top five VP choices authored by Chris Cillizza (a longtime Palin skeptic). This week, she finally enters the countdown at number five behind Mitt Romney, Tim Pawlenty, Rob Portman, and John Thune. It will be interesting to see if she continues to climb that list over the next few weeks. And for the record, Cillizza's top 5 candidates for Obama are 1. Sen. Evan Bayh (Indiana) 2. Gov. Tim Kaine (Virginia) 3. Sen. Jack Reed (Rhode Island) 4.Sen. Joe Biden (Delaware), and 5.Hillary Clinton. All but Kaine are entrenched members of the Washington establishment, and Kaine has roughly the same level of experience in government as Obama. Hence, all would be prefect foils for Gov. Palin. Thanks to Rassmussen Reports, video coming soon. UPDATE: My video software is continuing to be uncooperative, it is taking so long to upload that it will take at least another hour for Part 1, maybe all night. UPDATE: I am in the process of uploading two videos, roughly six minutes each, responding to Andrew Halcro's wild accusations. However, uploading to YouTube take some time. Part 1 of my response will be up in about an hour, Part 2 roughly an hour after that. I think you will find that the information provided will be worth the wait. We received a link today on the front page of the "Rassmussen Reports" polling company's website, under their "Rassmussen Reports in the News" section. Most of the other outlets linked in that section are large news organizations, so it is a high honor to be included. They linked to my entry detailing Scott Rasmussen's suggestion that John McCain select Gov. Palin as his running mate. As promised, I will have a detailed response to Andrew Halcro's salacious accusations against Gov. Palin this morning. I am in the process of recording a video response, which I expect to have posted within a few hours. I'm sure that by now, many of you are aware of the unfounded accusations against Gov. Palin being circulated by former gubernatorial candidate Andrew Halcro. While I am confident that these accusations will be fully refuted (and are imploding even as I write this), I will be withholding comment until morning in the interest of providing a thorough and detailed response. In the meantime, I will direct you to the official response issued by Gov. Palin and call on Mr. Halcro to stop refusing interview requests from the media. Now, regarding my comments section, I have a few housekeeping notes as a result of what I have been reading. First, for the time being, anti-Palin comments will be deleted. My first obligation is to my supporters, and I will not allow them to be harassed. This is a campaign site, not an open forum, and there are plenty of other places where you can make your voice heard. To my supporters, I would ask that you also keep your comments tasteful and respectful (i.e. no name calling, mudslinging, etc.). I have no desire to see any brawling in the comments section, and I will delete anything that I find to be overly antagonistic, regardless of who posts it. This is obviously a very sensitive issue, and I must take precautions to insure the integrity of this site. Please feel to continue discussing how we can support Gov. Palin, and I'll be back in the morning with a full update. Palin a guest-poster on Sen. John Cornyn's blog! While there have been a lot of blog posts about Gov. Palin, we now have the first known blog post by Gov. Palin! Today, she authored a post on energy and ANWR for U.S. Senator John Cornyn's blog. This is a big deal, as Sen. Cornyn is a leading voice on the energy issues. Other recent guests on his blog have included Newt Gingich and Mike Huckabee, so it's safe to say that this puts Gov. Palin in a very exclusive club. Many thanks to Sen. Cornyn for offering this platform to our favorite governor, let's make sure he gets lot of links as a token of our appreciation. UPDATE: Palin's post is also getting some ink on HotAir.com. Sean Hannity, Scott Rasmussen, and a big poll win! I've just finished listening to Monday's edition of the Sean Hannity show, and Palin got some major kudos. During the first hour, Hannity spent roughly four minutes discussing Palin's stands on drilling issues, noting that she is often mentioned as a potential VP for McCain. Then, in the third hour, he asked big-time pollsters Scott Rasmussen and John Zogby who they would advise the candidates to select as running mates. Rasmussen said that McCain should choose Sarah Palin! (Zogby wanted Charlie Crist, and both said Obama should take VA Gov. Tim Kaine). If you want to listen to the show in the online archives,the first Palin mention is about 38 minutes into the broadcast and Rasmussen's quote is roughly one hour and 26 minutes in. So, we now have a major pollster suggesting a Palin nomination! Also, Palin has built up a big lead in the CBS "VP Hot Sheet" poll. At the time of this writing, she has 42.02% of the vote, while second-place Charlie Crist has only 11.29%. While we targeted this poll last month when it first appeared, we lost the first week and have not targeted it since. So, the Palin win was not engineered by this site in any way. Sarah sighting in JibJab video. Well, for whatever it's worth, one of the web's leading political satire sites (JibJab.com) thinks that Gov. Palin could be in contention for the VP job. Hence, they gave her a her a brief cameo in their latest video, "Time for Some Campaignin'". Watch very carefully when the chorus of potential VP's pops out of the Straight Talk Express. Sarah has the second seat from the front, just behind Mitt Romney. I'll be doing a more detailed post containing actual news later today, but I thought this was good way to start the day. Yet another reason why we love Gov. Palin and think that her personality will endear her to millions of Americans. I just read this in the Philadelphia Inquirer, and I had to laugh out loud. Though, I have to say, I think Gov. Ed Rendell is dead wrong in his analysis. If anything, Palin helped her chances by separating herself from all of the fuddy-duddies attending the National Governors Association conference. ...there was lighter political chatter as well, because several governors are considered potential running mates for Barack Obama or John McCain. (Pensylvania Democrat Ed) Rendell made reference to the latter as he ribbed Alaska Gov. Sarah Palin, a Republican said to be on McCain's radar screen, about her behavior at a party for attendees Sunday night. "Gov. Palin was the first governor to dance, and the only governor to do the Electric Slide, thereby scratching herself from the McCain" ticket, Rendell joked. Sarah has her first vote at the GOP Convention! I received this email a few days ago and have procured permission to reprint it for you. While I am deleting identifying information, I can tell you that I have independently confirmed that this person is in fact a delegate to this year's Republican National Convention. "Just to let you know that you have one vote. I'm a delegate to the national convention from (state deleted) and I'm firmly for Sarah. I think she is what we need to kick start the GOP this year." Palin invites McCain to ANWR! UPDATE: This story has officially hit the mainstream media. The Anchorage Daily News has it up on their website, where it is currently a front page story. The following blurb is from an article posted today by John Gizzi of Human Events. He caught up with Gov. Palin at the National Governors Association's Centennial Meeting, and she said that she wants Senator McCain make the trek to ANWR! This move has been suggested by numerous national media outlets both as a way for McCain to seize the energy issue and an opportunity to "test drive" Gov. Palin as a running mate, and I am elated to see the governor trying to make it happen. Let's hope that the McCain campaign pounces on this phenomenal opportunity. Palin Says "Come to ANWR"
Philadelphia, Penn.--With John McCain still adamant in his opposition to oil exploration in the Arctic Natural Wildlife Reserve (ANWR), the governor of Alaska yesterday called on the soon-to-be Republican nominee for President to come to her state and see for himself the proposed site for drilling. "I'm asking him to come up and see ANWR," Republican Gov. Sarah Palin told me Saturday during the centennial meeting of the National Governors Association here. As to her discussions so far with McCain, Palin said "We agreed to disagree." But, she quickly added, "I am encourged with his evolved thinking on offshore drilling and I think he might come along on ANWR if he sees our 2000 acres for himself." Even Ted Stevens likes Palin's VP prospects! He said she would make an ideal running mate for presumed Republican presidential candidate John McCain in the upcoming general election. It's a buzz that he says remains strong back in Washington D.C.
"People come up and ask me what is she like and how is she doing?" Stevens said. "I've been asked that, and I've told them I think she would be a good vice president." Love him or hate him, Senator Stevens may have just delivered some very good news for our movement! Found this on YouTube this morning. It's not ours, and I didn't know it was being made, but it's brilliant! Kudos to supporter and YouTube poster "SLCPatriot" for putting it together! Why am I happy about an anti-Palin article? Jennifer Rubin has an article up at Pajamas Media promoting Former White House Budget Director Rob Portman and SEC Chairman Chris Cox as VP candidates while slamming Mitt Romney and Sarah Palin. She uses the worn out argument about Palin undermining McCain's experience-based campaign (to be refuted below), which I usually find annoying. So, why am I bouncing off the walls? Well, if you think about it, this is a big victory for our movement. If you are trying to promote an unlikely VP choice, you must first shoot down the perceived frontrunners. A few months ago, the task was to argue against Tim Pawlenty, Charlie Crist, Rob Portman, and Mitt Romney. Today, however, Rubin felt compelled to argue against only two people: Mitt Romney and Sarah Palin. This is the first tangible evidence of a trend that several of this site’s commenters have seen developing: an emerging narrative casting Romney and Palin as the two leaders in the GOP Veepstakes. Now, whether or not this narrative is actually true (and it well might be), it certainly is good for our movement to have Gov. Palin seen as a frontrunner. And the icing on the cake is that most of Rubin's own comments section seems to disagree with her assessment of Palin. Now, to address Rubin's criticisms: She claims that Gov. Palin's "thin resume" would undermine McCain’s strategy of portraying Obama as inexperienced. This is wrong on many, many different levels. First off, the experience argument alone cannot win the election for McCain. This is a "change" election, and McCain's best argument is that he is a more competent change agent than the inexperienced Obama. Palin actually reinforces that message, having upended Alaska’s entire political establishment. Obama can only talk about change, Palin made it happen. Furthermore, she has held elective office since 1988 (nine years longer than Barack Obama) and all but one of her positions have been executive (Obama's have all been legislative). Hence, as our "inexperienced" VP would have much more gravitas than the Democratic presidential candidate. Attacks on Palin's "inexperience" would ricochet back into Obama's face, sabotaging his candidacy. So, Gov. Palin not only adds youth to McCain's ticket, but also sets a booby trap for Obama on the experience issue. It's a ticket that just can't lose! "So who would help the ticket most as a VP selection? One interesting choice would be Alaska's very popular Governor, Sarah Palin. She would be an immediate media sensation and rob the Obama campaign of its monopoly of saturation media infatuation. Given the way the media was perceived to have ganged up on Hillary Clinton, there might be much greater care about avoiding doing it again with Palin. Of course Palin would be challenged for her youth and inexperience in foreign policy matters. But the reality is that Palin, unlike almost all US Senators (including Barack Obama), has actually run something, and with 84% approval for her job as Governor, seems to be running it well. Jimmy Carter, Michael Dukakis and Bill Clinton all ran for President directly from service as Governor. Raising the experience issue with Palin would be a risky strategy for the Obama campaign. After all, Palin would only be running for the #2 spot, and Obama, with arguably less of a track record, is running for the top spot. Palin would also be very effective in helping focus the energy issue, and the need to explore and drill for what we have in this country. She could take McCain to ANWR and give him reason to shift on that issue." MATTHEWS: Do you think it is possible that McCain will overcome his distaste for Mitt Romney and put him on the ticket and win this thing by going into those states that the Democrats use own Pennsylvania, Ohio, Michigan? DELAY: I think it is very possible. I think Romney is certainly the top leader right now on the list. There‘s some—the governor of Alaska is around there somewhere. QUICK ANNOUNCEMENT: Gov. Palin will be in the Lower 48 this Friday for a National Governors Association conference. NGA events usually involve lots of interviews, so we are looking forward to this weekend. Like so many good men, your Dad is blessed to have good women in his life. Getting to know his daughter, wife, mother (and other fabulous women featured on this blog) has been a treat. For the past couple months I've been reading up on Alaska's Governor Sarah Palin, and believe she would offer yet another good woman's influence and would be a real asset in John McCain's quest for the White House. Now, I don't want to make any wild assumptions about what this means, but the email was allowed to be posted. So, we can prove that Meghan McCain at least knows who Sarah is and will include her in a blog entry. And if Meghan McCain knows about something, so does everyone else on the Straight Talk Express. Palin to be profiled in People Magazine and the Wall Street Journal! The Anchorage Daily News' "Alaska Politics" blog is reporting that two major national media outlets are working on profiles of Gov. Palin. First, they confirm earlier reports that People Magazine will be featuring Palin in an upcoming issue. The article will "focus particular attention on Palin as mother of five children". In addition, it the ADN is reporting that Wall Street Journal writer Jim Carlton is putting together a "more general" profile. No word yet on exact publication dates, but I'm expecting both to appear relatively soon. People's people were in Alaska for Palin's photo shoot over a month ago, so they should be getting close to publication. KRISTOL: No, he's on board, expanding the military, winning the war in Iraq, signing the eavesdropping legislation. Anyway, I think he needs a reform conservative. I mean, the trick is to keep conservatives happy, add some energy to the ticket, and have a genuine reformer. I think that's -- two young governors stand out for me, Sarah Palin of Alaska, Bobby Jindal of Louisiana. Jindal's had a rough couple of weeks in Louisiana. He said he would veto a pay raise, then said he wouldn't, and then ended up doing so, a legislative pay raise. I think I've got to say Sarah Palin, whom I've only met once but I was awfully impressed by, a genuine reformer, defeated the establishment up there. It would be pretty wild to pick a young female Alaska governor, and I think, you know, McCain might as well go for it. (NPR's Juan) WILLIAMS: That would be interesting. I mean, that would energize the ticket, which I think is a great thing to do. So I haven't met her, but I just think that's an interesting choice. WILLIAMS: ... Sarah Palin. Go for it. "Palin can actually lay claim to being something of a courageous reformer, she threw down on Frank Murkowski and her own party bigwigs after becoming aware of their rampant lack of ethics. No one should mistake her for being some sort of stealth centrist in the tradition of Olympia Snowe! But, right now, she's more like the John McCain we once knew than the John McCain we're stuck with today. Her being on the ticket would probably be a bad thing, because it would underscore just how far off the mark John McCain has moved from his own reformist credentials." Read that again carefully. Linkins, who trashes almost everyone else he mentions in the column, has nothing bad to say about Palin. The only criticism he can muster is that she might look too good compared to McCain! Of course, this analysis leaves out the fact that Senator McCain has actually maintained his record as a reformer and is a bone fide American hero to boot. So, I'm sure that he would not feel diminished standing next to a fine VP candidate such as Sarah Palin. In other words, Linkins has no valid criticisms of a Palin nomination. Then he throws in this degrading tidbit. So, he has made himself look like a sexist pig two weeks in a row, and this week he actually tried to argue that Sen. McCain isn't good enough for Gov. Palin! Now, imagine the same reaction from the left-wing punditry and the Obama campaign…every day for two months! McCain could potentially cruise to victory while the Dems try to extract their feet from their mouths! Now, for the record, I have nothing personal against Mr. Linkins and I highly doubt that he is actually as chauvinistic as he sounds in his columns. However, I do think that his work is worth citing, as it illustrates yet again that there is simply no way to attack Sarah Palin without making a fool of oneself. While I'm sure that most people have better things to do today than read blogs, I would be remiss not to take note of some of the developments in our movement within the last few days. MSNBC's "FirstRead" political blog has started adding Palin to it's frequent "'Veepstakes" posts (Here, and here). The Phoenix Business Journal's Mike Sunnucks says that gas prices could have Sen. McCain taking a closer look at Gov. Palin. If you haven't checked the Intrade prediction markets lately, Gov. Palin is sitting in a strong third place in the betting on McCain's VP. She ranks behind only Romney and Pawlenty. And finally, in case you missed it, a Monday article in Investor's Business Daily quoted Hoover Institution research fellow Bill Whalen promoting the idea of a Palin candidacy. According to Whalen, Palin would be "mud in your eye to Democrats" and " a People magazine story waiting to happen". I have LOTS of news to post tommorrow (for those who are online on the 4th). However, tonight I want to give a shout-out to Douglas W. Burns, who has launched his own blog dedicated to getting Sarah Palin on the GOP ticket. It takes a special level of commitment to do something like that, and so far he has done a stellar job at posting up-to-the-minute news about Gov. Palin. Since I purposefully follow more of a "daily digest" format, I would highly encourage you to make Mr. Burns' blog part of your regular reading for breaking Palin news as it happens. Also, be sure to check out his other blog, "Iowa Political Alert". "The problem of course is that Palin is relatively inexperienced and unvetted. While [Governor Bobby] Jindal has gone through the ringer in the circle of Hell known as Louisiana politics, Palin is mostly a question mark." Now, we get (and successfully refute) the "inexperience" argument all the time. However, this new wrinkle disturbs me because it claims that Jindal, who has not been governor as long as Palin, has been "vetted" by Louisiana's hellish political system, while Palin has had smooth sailing up in Alaska. This is hogwash. Alaskan politics are very similar to Louisiana politics, and the two states compete for the title of "most corrupt in America". In fact, a serious case can be made that Palin has had to deal with a much more difficult situation than Jindal, who at least enjoys some cooperation from his state Republican Party. So, for the benefit of those who don't think that Sarah Palin has been tested by fire, I've decided to recount a few horror stories from the Great White North. In the coming days, I'll be posting accounts of Sarah's various encounters with the corrupt Alaskan establishment. I'll start with today with Palin's time as Mayor of Wasilla and work my way forward to the present. Stay tuned for the rest of the series. HORROR STORY #1: The showdown at City Hall (1996). Having already made enemies on City Council by not rubber-stamping senior members' pet projects (namely a ridiculous law requiring all citizens to purchase service from Councilman Nick Carney's garbage collection service), Councilwoman Palin ousts incumbent Joe Stein in the mayoral election. Councilman Carney personally tells the new mayor that he will do anything he can to make her life difficult, and stonewalls the proceedings to fill two vacant City Council seats. As nominations to the City Council require unanimous approval, Carney personally vetoes every nomination except that of Phillip Lockwood (who he supports, but who does not have the votes to receive the appointment). Mayor Palin responds by threatening to personally appoint new council members if the council cannot reach a decision, and Carney backs off. Meanwhile Police Chief Irl Stambaugh (a loyalist of Mayor Stein's) makes it clear that he is not pleased with the election of the new mayor, leading to his firing a few months later. Stambaugh then joins Carney and Stein in forming "Concerned Citizens of Wasilla" to push for Palin's removal from office. He also files a lawsuit claiming wrongful termination, contract violation, and (to top off the silliness) gender discrimination. The lawsuit fails, and Concerned Citizens of Wasilla's attempt at a town meeting disintegrates into what the Anchorage Daily News called, "two hours of sometimes raucous debate, occasionally interrupted by an incoherent man in his socks threatening to cue Carr's (a local grocery store) and the the fire marshal." They decide against a recall effort. So, in rising to the mayorship, Palin had to confront not only Mayor Stein, but also Councilman Carney and Chief Stambaugh. She came through with flying colors and neutralized the entire "good old boys" club in a matter of months. Next Time on "Horror Stories": The Randy Ruedrich Scandal.